Shailene Woodley and Ansel Elgort star in the young-adult cancer drama The Fault in Our Stars. Twentieth Century Fox has already made The Fault in Our Stars available for pre-order on DVD and Blu-ray. Watch the movie trailer and view the poster below. Based on the best-selling novel by John Green, Josh Boone (Stuck in Love) directed from an adapted script by 500 Days of Summer writers Scott Neustadter and Michael Weber. 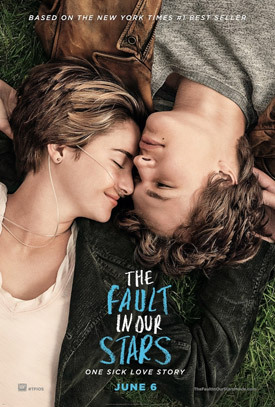 The story follows two young cancer patients, Hazel (Woodley) and Gus (Elgort), who fall for each other during treatment. MPAA Rating: PG-13 for thematic elements, some sexuality and brief strong language.